Diaries of a wartime British spy, released a few days ago, provide further insight into the origins of the Nuremberg Trial. According to a report in Friday’s Guardian, Guy Liddell was supportive of a plan prepared by the Director of Public Prosecutions, Sir Theobald Mathew, whereby selected Nazis would be ‘bumped off’ rather than put on trial following a report from a commission of inquiry. On 21 June 1945, Liddell dictated a diary entry to his secretary about a visit to his office by a British War Crimes Executive official, and representatives of MI6 and the Special Operations Executive, looking for evidence to support a war crimes prosecution. "Personally I think the whole procedure is quite dreadful. The DPP had recommended that a fact-finding committee should come to the conclusion that certain people should be bumped off and that others should receive varying terms of imprisonment, that this should be put to the House of Commons and that the authority should be given to any military body finding these individuals in their area to arrest them and inflict whatever punishment had been decided on. This was a much clearer proposition and would not bring the law into disrepute. "Winston had put this forward at Yalta but Roosevelt felt that the Americans would want a trial. Joe supported Roosevelt on the perfectly frank grounds that Russians liked public trials for propaganda purposes. It seems to me that we are just being dragged down to the level of the travesties of justice that have been taking place in the USSR for the past 20 yrs." In July 1946, Liddell flew to Nuremberg with the deputy head of MI5, Oswald Harker, to watch the prosecution of 21 senior Nazis, including Hermann Göring ("considerably reduced in size") and Albert Speer ("probably one of the ablest in the dock"). There, he felt his fear that the tribunals would be little better than show trials had been confirmed. "One cannot escape the feeling that most of the things the 21 are accused of having done over a period of 14 years, the Russians have done over a period of 28 years. This adds considerably to the somewhat phoney atmosphere of the whole proceedings and leads me to the point which in a way worries me most, namely, that the court is one of the victors who have framed their own charter, their own procedure and their own rules of evidence in order to deal with the vanquished." Liddell did not want the Nazis prosecuted for waging a war of aggression. "One cannot help feeling ... a dangerous precedent is being created," he said. 1. H.M.G. assume that it is beyond question that Hitler and a number of arch-criminals associated with him (including Mussolini) must, so far as they fall into Allied hands, suffer the penalty of death for their conduct leading up to the war and for the wickedness which they have either themselves perpetrated or have authorized in the conduct of the war. It would be manifestly impossible to punish war criminals of a lower grade by a capital sentence pronounced by a Military Court unless the ringleaders are dealt with with equal severity. This is really involved in the concluding sentence of the Moscow Declaration on this subject, which reserves for the arch-criminals whose offences have no special localization treatment to be determined in due course by the Allies. 2. It being conceded that these leaders must suffer death, the question arises whether they should be tried by some form of tribunal claiming to exercise judicial functions, or whether the decision taken by the Allies should be reached and enforced without the machinery of a trial H.M.G. thoroughly appreciate the arguments which have been advanced in favour of some form of preliminary trial But H.M.G. are also deeply impressed with the dangers and difficulties of this course, and they wish to put before their principal Allies, in a connected form, the arguments which have led them to think that execution without trial is the preferable course. 3. The central consideration for deciding this difficult choice must, in H.M.G. 's view, be reached by asking-what is the real charge which Allied people and the world as a whole makes against Hitler. It is the totality of his offences against the international standard which civilised countries try to observe which makes him the scoundrel that he is. If he were to be indicted for these offences in the manner that is necessary for reasons of justice in a criminal court, and if his fate is to be determined on the conclusion reached by the tribunal as to the truth of this bundle of charges and the adequacy of the proof, it seems impossible to conceive that the trial would not be exceedingly long and elaborate. He, of course, must have in such a trial all the rights properly conceded to an accused person. He must be defended, if he wishes, by counsel, and he must call any relevant evidence. According to British ideas, at any rate, his defence could not be forcibly shut down or limited because it involves a great expenditure of time. There is nothing upon which British opinion is more sensitive in the realm of criminal procedure than the suspicion that an accused person - whatever the depths of his crime - has been denied his full defence. 5. There is a further point. Reference has been made above to Hitler's conduct leading up to the war as one of the crimes on which the Allies would rely. There should be included in this the unprovoked attacks which, since the original declaration of war, he has made on various countries. These are not war crimes in the ordinary sense, nor is it at all clear that they can properly be described as crimes under international law. These would, however, necessarily have to be part of the charge and if the tribunal had - as presumably they would have - to proceed according to international law, an argument, which might be a formidable argument, would be open to the accused that this part of the indictment should be struck out. It may well be thought by some that these acts ought to be regarded as crimes under international law. Under the procedure suggested this would be a matter for the tribunal, and would at any rate give the accused the opportunity of basing arguments on what has happened in the past and what has been done by various countries in declaring war which resulted in acquiring new territory, which certainly were not regarded at the time as crimes against international law. 6. H.M.G. earnestly hope that their Allies will consider the arguments set out above for they are most anxious that a very early agreement should be reached as to the method of dealing with Hitler and his chief associates, and that the method should be one in which the principal Allies concur. It would in any case be valuable if a document could now be drawn up giving the reasoned basis for the punishment of the men concerned. 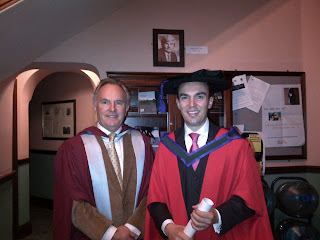 Mario Silva was in Galway yesterday, where he was awarded his PhD. Mario is currently a member of the Task Force for International Cooperation on Holocaust Education, Remembrance and Research. Next year, he will be its Chairman. Here he is with Prof. Ray Murphy, who is currently directing the Irish Centre for Human Rights. Congratulations, Mario. Sorry I couldn't be with you. JEDDAH: The Shoura Council has made a major decision toward reducing instances of capital punishment in the Kingdom by stipulating that a death sentence issued on the basis of a judge's discretionary power becomes final only if the verdict is unanimous. "The ruling of an appeals court on a lower court's decision to kill by execution, stoning, amputation, or qisas (legally entitled retribution for a victim or his relatives) etc... will not be final except after it is endorsed by the Supreme Court. The court's endorsement of the death penalty on taazir (a judge's discretion in situations where no religious punishment is prescribed) should not be made final unless it is by unanimous agreement," the council stipulated while discussing recommendations on criminal regulations made by the Committee for Islamic & Governmental Affairs. The council voted down the committee's recommendation that the implementation of taazir for death punishment can be implemented even if the decision is made without unanimity. This is useful evidence that the trend to reduction and abolition of the death penalty manifests itself even in some countries that have the worst records on the subject. 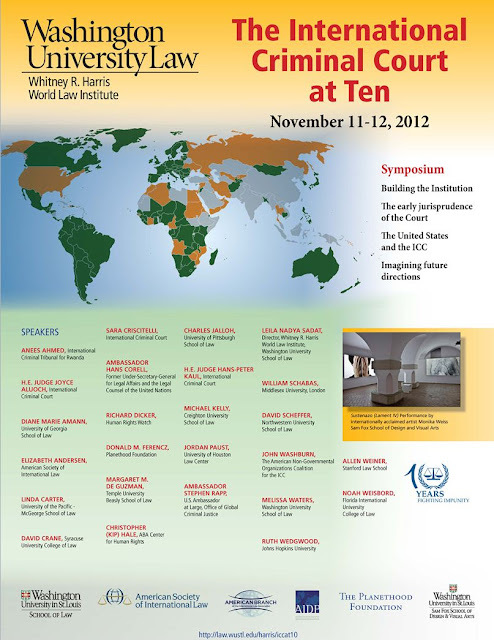 Last week, I attended the Regional Conference on Capital Punishment held in Rabat, Morocco. Participating on the keynote panel, I expressed the view that by presenting the issue in terms of retentionist and abolitionist states there was a danger that we would conceal an important truth, namely that the death penalty is in sharp decline in the relatively small number of states that still employ it. This week, the Special Rapporteur on Extrajudicial, Summary and Arbitrary Executions and the Special Rapporteur on Torture will be presenting their recent reports on capital punishment to the General Assembly. It will be interesting to see the response from some of the States that traditionally try to defend the death penalty on such occasions. Foremost among them are Egypt and Singapore. But political changes in Egypt may influence its tone. And Singapore’s rate of execution has declined dramatically in recent years. Let us see what happens. Next month, the bi-annual resolution on a moratorium on capital punishment returns to the General Assembly. Two years ago, there were some slight changes in the vote (compared with 2008) that revealed a shift in the Arab world. A perceptive observer might have seen this as a sign of more dramatic developments, but I don’t think anybody did at the time. Yes only a few weeks after the resolution, the Arab Spring began. The bi-annual resolution on capital punishment provides a way to take the temperature not only with respect to the status of the death penalty in the world but, in a more general sense, on progressive developments in the field of human rights. 1. SCSL Rules required that Judge Sow participates in all deliberations. If the other three Judges held deliberations without him, that is problematic. He is a very deligent Judge, the only one who is said not to have missed a single sitting of the case. If he says there were no deliberations, we have to believe he means what he says, there were no deliberations. If there were deliberations, then the other three must come out and either prove it or say so. 2. Volume of the Judgment: If you look at the first 750 pages closely, you will notice that it is a cut and paste job from previous judgements. In case you are not aware, the formating of the original judgement told it all. You will notice that the judgement was issued, posted on the Court's site, withdrawn from the SCSL site and refiled. 3. If rules are important, then Justice Julia Sebutinde of Uganda was unavailable from the date she took office at the ICJ. ICJ rules do not allow her to continue sitting at SCSL and neither do UN rules allow her to hold any other judicial office other than the SCSL, except with the permission of the appointing authority. As far as Judge Sow was concerned, he had become a substantive Judge from the date Sebutinde became unavailable. He is convinced that it was within his remit to make the statement that he made. He was technically a substantive Judge with a right to dissent. Lastly, before you get tough on the Defence and Sow, find out why it was so important that Julia Sebutinde of Uganda remained in Office for the Taylor Judgement at all costs, against all rules and odds. Who is flouting the rules here, Judge Sow or The Court and Sebutinde. Consider unprecedented 14 rounds of voting for ICJ Justice Sebutinde, she gets the majority in the GA but the SC (read America) says no.........remember wikileaks, Sebutinde and the Americans at war with each other, then suddenly, she bags the ICJ job but she must remain on the Taylor Bench? Why did we have an alternate Judge at all? He could have taken over her role on the Taylor . She missed many Court sessions but Judge Sow did not? In summary, perversion of justice, Taylor was guilty before his trial began. This is what we human rights activists should abhor, using International systems to endorse political agendas. Sow did human rights a great favour, the rules we love and respect are destined to fail if we continue this way. University of London is hosting a one-day interdisciplinary research conference on 20 November for postgraduate students in human rights. Here are the details: School of Advanced Study, University of London,?Room S261 (Second floor),?Senate House (South Block),?Malet Street,?London WC1E 7HU. There is a very modest registration fee. Please send abstracts of up to 300-350 words to HRC@sas.ac.uk by 26 October 2012. Presenters will be asked to speak for 15-20 minutes on their research proposal and work to date. Here is an interesting new website on capital punishment in Serbia. Prof. Michael Bohlander has been trying to post a comment on the affaire Sow, but without success for what must be technical reasons. He has asked me to put his criticisms on the blog, something I am more than happy to do. I often receive comments that are critical of my own views and, as readers of this blog will know, am always pleased to publish them. Before we get to Michael's comments, however, I want to point out that I must have been misunderstood. I am not particularly concerned about whether or not Judge Sow (or his colleagues) behaved properly. The apparent attempt to remove him from office seems a disproportionate response, in any case, although it seems largely theoretical given the fact that the work of the Trial Chamber is finished. Probably it is not a good idea for judges to be left to discipline themselves. I don't think most national judicial systems do this, no doubt for good reason. It is of course a fact that two judges are enough to convict, although the examples where one of the three judges believes guilt is not proven beyond a reasonable doubt are extremely rare. Perhaps it is not a good idea to allow two out of three judges to convict, at least on issues of fact. If one out of three (or one out of four) professional judges, elected at the highest level, has reasonable doubts about the guilt of an individual, perhaps that should be enough to make a verdict insecure. That is my only concern here. Unlike Dr Mezyaev I cannot support your criticisms. What Judge Sow did was unprofessional and may very well constitute judicial misconduct of a grave nature. Procedural rules and their observance are an integral and often neglected part of the concept of the rule of law. A former ICTY judge once likened their relationship to the task of the court as that of the handmaiden, not the mistress. Such a view can only have come from a common law judge, but I digress. These rules have to do with a core area of the rule of law, namely judicial conduct and ethics, and I thus fail to see how one can view this as secondary. One should always start by assuming that issues such as the individual judge’s right to state their view and the need for an effective functioning of the administration of justice have been carefully balanced when the rules were made. One cannot just push them aside if in an individual case they lead to a result unpalatable to an observer. Judge Sow was a non-activated alternate judge. He was not called to decide upon the case. He did thus not even have the right to declare a dissenting opinion. His views were and are in law irrelevant. How do we know, as Dr Mezyaev says, that Judge Sow spoke out “against injustice”? Have we seen the evidence in the case ourselves? Were we present at the deliberations or did we witness their absence? Is it not close to arrogance to second-guess the majority’s view and label it with such strong words from the armchair view? The concern of the other ICTY judge you mention who was apparently flabbergasted that his own doubts did not lead the other judges to have the same doubts, is evidence of a fundamental misconception of the workings of collegiate panels. It is a banal fact that the very notion of a majority verdict by necessity implies that the judges may disagree on reasonable doubt. In my own 13 years of judicial experience I encountered such situations from time to time. Naturally, being outvoted is not a pleasant experience, especially if one feels strongly about a point, but unless your legal system allows you to write a dissent, that must be the end of it. "The only moment where a Judge can express his opinion, is during the deliberations or in the courtroom, and pursuant to the Rules, where there is no deliberations, the only place left for me in the courtroom. I won't get - - because I think we have been sitting for too long but for me I have my dissenting opinion and I disagree with the findings and conclusions of the other Judges, because for me under any mode of liability, under any accepted standard of proof the guilt of the accused from the evidence provided in this trial is not proved beyond reasonable doubt by the Prosecution. And my only worry is that the whole system is not consistent with all the principles we know and love, and the system is not consistent with all the values of international criminal justice, and I'm afraid the whole system is under grave danger of just losing all credibility, and I'm afraid this whole thing is headed for failure. Thank you for your attention." (public Annex A to the Defence Motion of 19 July 2012). Taken at its highest, this could be interpreted as an accusation of the majority of perverting the course of justice by not deliberating (at all). That apparently is the thrust of the defence motion. Judge Sow’s aperçus from the bench seem to insinuate that the Trial Chamber did not deliberate on the verdict. Deliberations are secret. Disagreeing judges can write dissents. Judge Sow was not entitled to a dissent because he was not called upon to decide the verdict. So he made his concerns known in the courtroom, albeit rather nebulously. The other communications in the disciplinary proceedings, including the email from Judge Sow responding to the charges, are confidential, apparently. If he is alleging not just a difference of opinion (in which case he should have remained silent in the first place) but an absence of deliberations and as such a fundamental breach of procedure and possibly a perversion of the course of justice, one wonders why he did not go public with an explicit statement to the press etc. if he took the step of announcing such a thing in open court in such awkward words, with the obvious risk of disciplinary consequences. He might even be justified in doing so under general aspects of the necessity defence, yet that would need a lot more specification of his insinuated allegations. The defence apparently pins its hopes on those five words “where there is no deliberations”. Unless Judge Sow supports this with more specific and testable allegations, it seems a bit difficult to believe that such a voluminous judgment was arrived at without any deliberation. Judge Sow’s comment may just mean no more than that he felt aggrieved that his views were not shared by the others or possibly given short shrift because he was a non-activated alternate judge. I am also somewhat bemused by the fact that the defence accepts that the judges are not actually biased, but then proceeds to base its disqualification motion on the “appearance of bias” gound. By their own admission of absence of actual bias they destroy the ground based on mere appearance. Logically, the latter is normally meant to be used if one suspects bias even if one cannot prove it, it is then that an appearance based on a fair-minded informed observer is sufficient. The disqualification procedure is, however, not an end in and of itself: If there is no actual bias, as the defence admits, then such a motion should not be filed; it is frivolous. 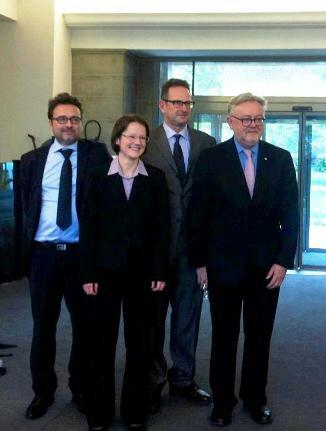 From left, Prof. Chetail, Dr. Schmid, Prof. Clapham and myself. Evelyne Schmid successfully defended her doctoral thesis, entitled 'Violations of Economic, Social and Cultural Rights in International and Transnational Criminal Law', on Thursday at the Graduate Institute of International and Developments Studies, in Geneva. Dr Schmid is now working as a lecturer at the University of Bangor, in Wales. Her work was supervised by Prof. Andrew Clapham. I was the external examiner and Prof. Vincent Chetail was the internal examiner. Congratualations, Evelyne. An interesting decision on victim participation has been issued by Trial Chamber V of the International Criminal Court, which is hearing the Muthuara and Kenyatta case in the Situation in Kenya. One of the members of the Trial Chamber, Judge Van den Wyngaert, has already made her views known about witnesses and their participation in public lectures and in an article in the Case Western Journal of International Law. One of the interesting features of the decision is the adoption of an innovative approach that may not be entirely in line with what is prescribed in the Rules of Procedure and Evidence. There is a discussion of the relationship between the Statute and the subsidiary legal instruments. Middlesex University is a very dynamic place right now. A few months ago, the new School of Law was created. This week, its new dean, Professor Joshua Castellino, announced that the European Human Rights Advocacy Centre, formerly based at London Metropolitan University, will be moving to the Middlesex School of Law, where it will re-constitute itself as a separate Centre and sit alongside the Social Policy Research Centre. The five-member Centre, directed by Professor Philip Leach, will pursue its focus on human rights litigation before the European Court of Human Rights. Its most recent work has focused on the human rights violations in Chechnya and elsewhere in the region that can broadly be described as the former Soviet Union, where they work very closely with the well-known Russian NGO Memorial. This is a great addition to Middlesex that should provide our students with an opportunity to gain internships and valuable experience. Professor Philip Leach is a scholar of international repute with an outstanding research profile, which includes his highly acclaimed Oxford University Press book Taking a Case to the European Court of Human Rights. Ben Ferencz in 1948 in the Nuremberg courtroom. 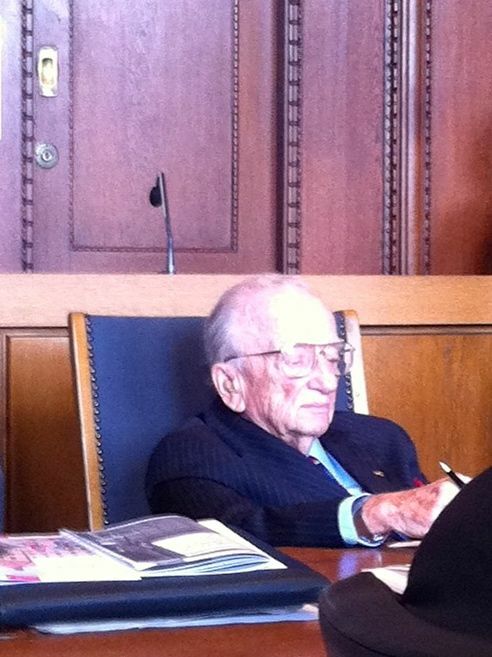 Ben Ferencz, taken yesterday in the Nuremberg courtroom. Behind him is the door through which the Nazi defendants entered.